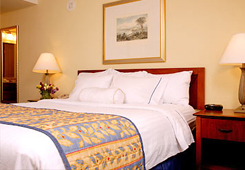 A great waterfront location just a short walk across a bridge from Downtown Boston plus affordable rates make the Marriott Residence Inn Charlestown a top choice for both short trips and extended hotel stays. 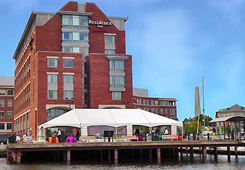 Located on Tudor Wharf overlooking Boston Harbor, the Residence Inn Charlestown perches at the edge of the historic Charlestown Navy Yard. 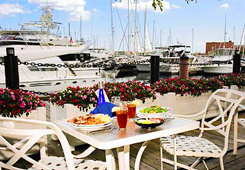 Hidden behind the boats in the photo below is one of the nicest outdoor dining areas in Boston with unbeatable views. Go on a free guided tour of the USS Constitution in the nearby Navy Yard, and stroll into the North End for delicious Italian pastries. 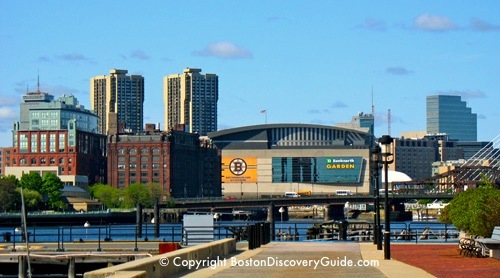 Boston's North End and TD Garden where the Boston Bruins and Celtics play are just a 10-minute walk or ferry ride away. I stood on Tudor Wharf next to the Residence Inn while taking this photo of "The Garden" (as locals call TD Garden) - you almost feel like you can reach out and touch it. Just to the left, beyond the edge of the photo, is Boston's North End, filled with mouth-watering Italian restaurants and bakeries. The Marriott Residence Inn has 168 suites, a well-equipped fitness room, a nice indoor swimming pool, and is pet-friendly. If you like, you can request one of the allergy-friendly rooms. The hotel is popular for short stays, and is also a great choice for extended hotel stays because of its location and amenities. Like all Residence Inns, it serves a very nice hot buffet breakfast. 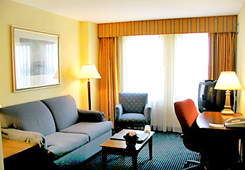 Suites have comfortable living rooms, with a small dining table and kitchenette. Many of them have gorgeous views of Boston Harbor. The hotel has a pleasant patio seating on the dock. You'll find lots of nearby areas for walking, taking photographs, and enjoying the views, such as the Bunker Hill Monument, visible in the background of the photo on the left. Rates are surprisingly attractive - usually significantly less than the waterfront hotels in Downtown Boston and the North End. What Other Attractions Are Close to the Residence Inn? In addition to TD Garden and Boston's North End, you'll find plenty of interesting sights in Charlestown itself. 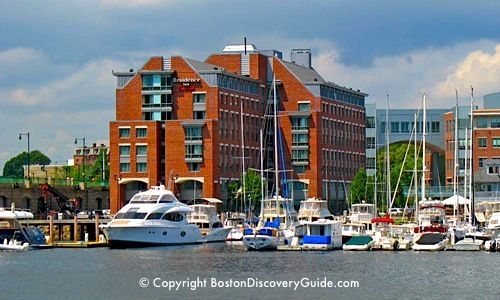 The hotel is located at the edge of the Charlestown Navy Yard, where you'll find the USS Constitution and Constitution Museum, part of the historic Freedom Trail. Be sure to go on one of the fascinating free ship tours. You may also find the nearby cannons and huge ship anchors interesting. You can continue on the Freedom Trail to the Bunker Hill Monument. You'll also find other interesting areas to explore in Charlestown, plus some very good restaurants.